This is the first in a series of posts in which I will describe my vision for the first phase of a small streets village on the Midway, which I originally proposed in my first post. For this phase, I strive to be minimally intrusive to make the plan more palatable to a potentially hostile public. Phase 1 will occupy the inner part of the Midway between the east- and west-bound roadways. The Metra tracks will form the eastern boundary, and Woodlawn Avenue will form the western boundary. Buildling on this plot would require building over only one existing street, Dorchester Avenue, which would be routed through the village at a much smaller scale. The plot comprises a bit over 12 acres, or 525,000 square feet, which is roughly half the size of Strand East in London. The focal point of Phase I will be an open square, about 1.5 acres in area, centered around the statue of Masaryk (the name “Masaryk Square” has a nice ring to it). This might seem oversized for a 12-acre project, but if the goal is to expand to the whole Midway, an appropriately sized gateway is needed. The square will connect in two places to the 59th Street Metra station. The main streets will be 15 feet wide, and the secondary streets will be 10 feet. The main streets will connect to the existing pedestrian paths on the north and south between Woodlawn and Dorchester, and will terminate at the north and south corners on Woodlawn. Secondary streets will fill in the gaps to provide appropriate access to buildings. The diagram below shows a rough sketch of the layout, including potential courtyard areas. 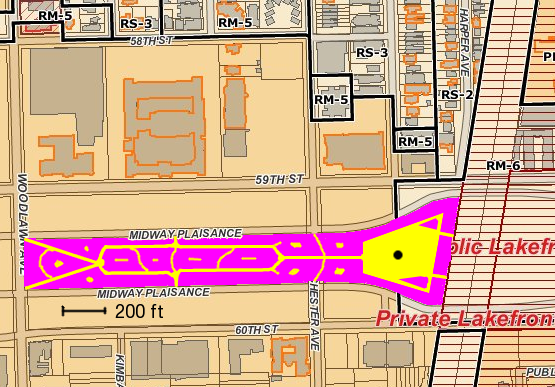 The pink areas are buildings, the yellow areas are streets and courtyards, and the black dot is the Masaryk statue. Even including the large square, more than 70% of the area is devoted to buildings, compared to less than 40% for some major US urban cores. Excluding the square and its surrounding buildings bumps this up to more than 80%. If we allow a reasonably generous 250 square feet per resident, and an average of three residential floors per building, then Phase 1 will house nearly 2,000 people, with plenty of additional space for retail. If we assume a 75% building density for the entire Midway from 59th Street to 60th, Cottage Grove to Stony Island, then more than 25,000 people can live on the Midway, even assuming very modest building heights! Of course, a walkable small streets village should have more than just residences; in particular, there should be plenty of ground-level retail. In the next part of this series, I will discuss the scale of the buildings and the mix of uses they might contain. This entry was posted in Midway Village. Bookmark the permalink.